Pop group AlunaGeorge tackle big issues on their second album, I Remember. Singer Aluna Francis explains her inspirations. "It would actually be quite refreshing if we had somebody to compete against." Aluna Francis isn't being arrogant, she's stating fact. 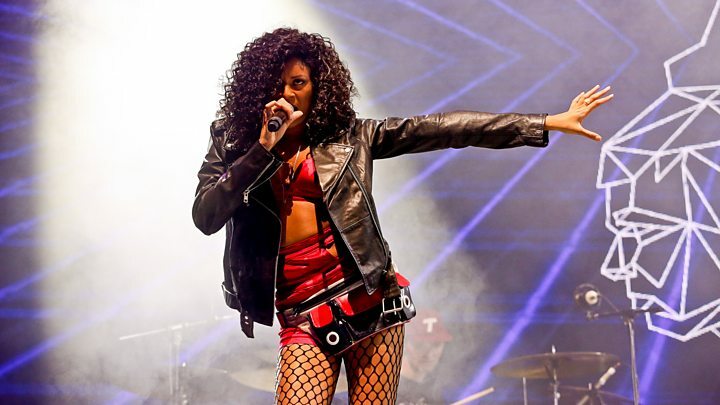 The band she formed with musician George Reid - cunningly titled AlunaGeorge - defy categorisation. They're a little bit R&B, a little bit garage, a little bit dancehall and several other genres besides. Capping it all off is Francis, whose childish-but-fierce vocals are a Trojan horse for lyrics about sexism, racism and the tricky business of falling in and out of love. "It's shut the door to fast, flash-in-the-pan success, for sure. But if you like one of our songs that peaks inside the Top 40, you can research us and we have a back catalogue of music." With Reid retreating to a more back-room role, Francis takes us on a tour through the themes and sounds of their upcoming second album, I Remember. It's been three years since your debut album, Body Music. Why the delay? I know! We deserve to be told we took a long time. We did think we had the album finished a couple of times and then we'd write one extra song and think, 'that's raised the standard, and we have to raise everything else up to that standard'. On the first record, you and George were still getting to know each other. How has your partnership developed? I guess we felt more free this time round because of the solidity of our relationship. One of the things we found is that we have a very particular vibe that we bring to the studio wherever we are. If you put a drop of us in anything, it's going to sound like us. But there has been development - your style is perhaps even more eclectic than before. I hope that people enjoy the second album more. The first album is the discovery album… You know Pablo Honey by Radiohead? There's one classic song on there, but you don't really want to listen to the whole album. By the second album, you're totally down for the whole thing - but you still want the first album to be there. You don't want them to have appeared out of nowhere, because you can't trust it. So if I Remember is your version of The Bends, have we got an OK Computer to come? The first song on I Remember, Full Swing, is about a man watching his wife competing in the Olympics. How did you come up with that lyric? I have a lot of strong women around me and there's an assumption they won't be able to find somebody who's able to champion their career. But I was like, "do you know what? It does exist". There are definitely men out there who get high on a woman achieving something, and not being jealous or emasculated. If you're a man and you can love a woman who is doing something big like that, it means so much. It could even be the reason why they succeed. My Blood is political in another sense - it seems to be about the dichotomy between workers and the ruling class. There's a tiny percentage of people that benefit from us fighting each other. Racism itself is a capitalist invention. So whenever people engage in racism, somebody benefits financially. So I'm creating an imaginary scenario where someone on the front line stops and asks one of the people who's benefitting financially to come and join them: "Would you come and fight for this cause?" When they say "of course not", would you still choose that method of moving forward, or would you do something cleverer? Like bury the hatchet, make peace, or start negotiations? You've been performing that song in the US recently. What has the response been like? I would imagine it's similar to what I felt when I went to a Black Lives Matter meeting. You realise you're not the only one thinking about this, feeling it and looking at it. Which is a relief. It gives you a little bit of hope. Having been out in the US this year, what's your perspective on the presidential race? I wonder if the effect of Trump has almost been to desensitize us to his sensationalist rallying of anger and frustration. At this point, I don't know how much the average white person in middle America hates black people. There's maybe only so long you can ride on that wave before they get bored and are like, "well, this isn't making a difference to my life". It's hard to get people angry these days for any sustained period of time and I think that goes for racism as well. It was one of the last strongholds to incite rage, but it's kind of very quickly become quite funny. Because it seems so irrational? Yeah, so many of the arguments are so easily destabilised that even people who are less well-educated can see through them. I think relying on people's stupidity and bigotry and hatred is a dangerous game because it runs out. People get exhausted. I think Trump's campaign is going to die on its arse because it's going to lose power and energy. Your current single, Mean What I Mean, is the true story of being accosted by a man who refused to take "no" for an answer. That must have been a frightening experience. It took me by surprise. I forgot that you are still vulnerable in certain situations. In fact, it took me a while to even realise what had happened. I was making stupid jokes but [I was] actually really hurt. I'd tell myself it was nothing, but it wasn't nothing, it was sexual harassment. What I wanted to do with the song was to throw the most powerful ingredient into it, which was the feel-good factor. That adds in the [idea that] I've already won. I live in 2016, so what I'm going to do is apply what I've learned to this situation and enjoy the results. Speaking of sexism, there's often a perception in male-female duos that the woman is "just the singer". Have you had to confront that prejudice? Back in the day, with someone like Etta James their job was to interpret a song in the best possible way. You could never imagine the geeky songwriter in a cupboard somewhere - the singer would really do the song justice. So if people think I'm "just a singer" that doesn't hurt me so much. It's unusual to sit down with a pop act and discuss "big themes" in their lyrics. Were you always a writer? I struggled with English at school but I'm a real reader. I love to just swallow a novel. I'll pretty much read anything to be honest with you. But I either try to get one of the New York Times' best-sellers, or go back to one of the classics. I've been going through the Murakami back catalogue, and I love Tolkien. You're about to go on tour with Sia. What do you think of her decision to reject celebrity and cover up her face when she performs? I think it's a very inspirational comment on our society and the way we think that we need to see so much about an artist. I think it's a myth that everyone wants to see everything, warts-and-all. What you eat for lunch, or how long it takes you to do up your shoelaces. A lot of the job of being a musician is really boring. Sitting in airports. Getting off the bus directly into a festival, having not showered, and it's 110 degrees and you're not going to have a shower before your next show and you just walk around like a zombie going "is there food anywhere?". It's very confusing. I'm in the process of untangling the confusion and deciding what I want to share. I don't feel like sharing something as boring as my breakfast. You mean you don't get special pop star cornflakes? Well, maybe I do but I don't know how that helps anyone else! AlunaGeorge's new album, I Remember, is out on Friday, 16 September.